Inside 1st Microraion, Kstovo, Russia. This district was built in the late 1960s, and by the 2000s the trees have grown taller than the 5-story apartment buildings. 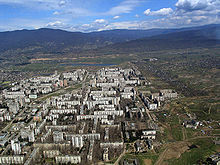 Microdistrict, or microraion (Russian: микрорайо́н, mikrorajón; Belarusian: мікрараён, mikrarajon; Ukrainian: мікрорайон, Armenian: միկրոշրջան, translit. 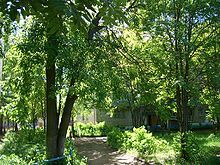 mikrošrǯan, Kyrgyz: кичирайон) is a residential complex—a primary structural element of the residential area construction in the Soviet Union and in some post-Soviet and former Communist states. 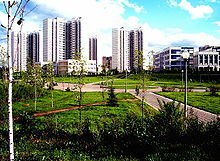 Residential districts in most of the cities and towns in Russia and the republics of the former Soviet Union were built in accordance with this concept. 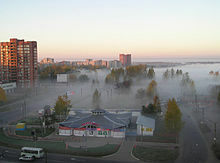 According to the Construction Rules and Regulations of the Soviet Union, a typical microdistrict covered the area of 10–60 hectares (30–160 acres), up to but not exceeding 80 hectares (200 acres) in some cases, and comprised residential dwellings (usually multi-story apartment buildings) and public service buildings. As a general rule, major motor roads, greenways, and natural obstacles served as boundaries between microdistricts, allowing an overall reduction in city road construction and maintenance costs and emphasizing public transportation. Major motor roads or through streets were not to cross microdistricts' territories. The entrances to a microdistrict's territory were to be located no further than 300 meters (1000 ft) apart. Standards also regulated the accessibility of the public service buildings (excluding schools and pre-school facilities) by imposing a 500-meter (1,500–foot) limit as the farthest distance from any residential dwelling. One of the city-planners' tasks was to ensure that the fewest public buildings were built to cover the microdistrict's territory in accordance with the norms. 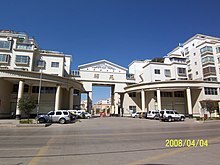 Typical public service structures include secondary schools, pre-school establishments (usually combined kindergarten and nursery), grocery stores, personal service shops, cafeterias, clubs, playgrounds, and building maintenance offices, as well as a number of specialized shops. The exact number of buildings of each type depended on the distance requirement and the microdistrict's population density and was determined by means of certain per capita standards. The history of microdistricts as an urban planning concept dates back to the 1920s, when the Soviet Union underwent rapid urbanization. 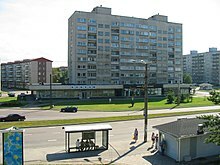 Under the Soviet urban planning ideologies of the 1920s, residential complexes—compact territories with residential dwellings, schools, shops, entertainment facilities, and green spaces—started to prevail in urban planning practice, as they allowed for more careful and efficient planning of the rapid urban expansion. These complexes were seen as an opportunity to build a collective society, an environment suitable and necessary for the new way of life. In the 1930s, residential complexes grew in size, covering territories of up to five to six hectares. A system of building residential complexes was gradually replaced with a concept of a city block. Such blocks generally comprised residential buildings along the perimeter, and residential buildings intermingled with public service buildings on the interior. However, it proved unfeasible to provide all public services within every city block, due to the latter's relatively compact size; it was not unusual to have a school, a kindergarten, or a store serving the population of several blocks, which were often separated by major motor roads. The system of the city block also required a developed network of roads, thus increasing the maintenance and construction costs and complicating the organization of public transportation. The 1940s and 1950s saw further enlargement and grouping of the city blocks. However, new construction was based on the same principles as in the previous decades, and could not keep up with the increasing housing demand. Labor-intensive industrialization of the country demanded ever more workers, which was hard to achieve with housing accommodation lacking. Soviet authorities revisited issues of urban planning in the mid-1950s. The new urban planning concept built on the concept of residential districts (with 10,000–30,000 inhabitants each), consisting of several microdistricts (with 8,000–12,000 inhabitants each), which in their turn comprised several residential complexes (with 1,000–1,500 inhabitants each). In larger cities, residential districts were grouped into urban zones, the population of which could reach one million. Each microdistrict provided the population with facilities needed on a daily basis, whereas services in lesser demand were available on the residential-district level. This concept was backed up with reorganization of the Soviet construction industry—panel-block apartment buildings became widespread as they allowed for fast, although often low-quality, construction, reduced costs, and economies of scale. The whole construction process became simplified and standardized, leading to the erection of the rows and rows of faceless grey rectangular apartment-buildings which now prevail in every city and town of the countries of the former Soviet Union. Such drastic reduction of building costs was necessary because flats in the new blocks were given to the citizens free of charge at the time. Humorous insights into the potential consequences of living in such a bland and repetitive atmosphere appear in the hugely popular Mosfilm production The Irony of Fate (1976). The dissolution of the Soviet Union led to a sharp decline in the volume of residential construction. During the 1990s, urban planning was mostly ignored as there was virtually no new construction. 2000s brought slow growth to the volume of housing construction, as well as heightened criticisms of the microdistrict model. Urban planning, no longer the direct responsibility of central governments, was delegated to the regions; some (including Ukraine and Moldova) of which are now coping with the task of maintaining deteriorating Soviet-era housing assets. Since the mid-2000s, many apartment blocks have either been modernised or replaced with modern skyscrapers. In China, this type of neighbourhood unit is known as Xiaoqu (Chinese: 小区; pinyin: xiǎoqū). First built in the 1980s, preceding the Chinese economic reform, they were very similar to the concept as known in the Soviet Union. Xiaoqu similarly promoted a sense of community among the inhabitants. However, after the economy was opened up more for commercial real estate developers, Xiaoqu continued to be built, but evolved in several ways such as differentiation in luxury, safety and available services. The apartments are owned by the inhabitants, and the Xiaoqu is often enclosed by a wall, with the entrance gate being guarded. ^ David Bray (2005). Social Space and Governance in Urban China: The Danwei System from Origins to Reform. Stanford University Press. p. 177. ISBN 978-0-8047-5038-7. ^ Wallenwein, Fabienne (9 December 2013). The Housing Model xiaoqu 小区: the Expression of an Increasing Polarization of the Urban Population in Chinese Cities? (PDF) (Thesis). Retrieved 27 February 2017. Great Soviet Encyclopedia, entry on "микрорайон"